Disney’s new animated film Frozen, is based on Hans Christian Andersen’s story of the Snow Queen. The story is set in a northern paradise called Arendelle, an idyllic village on the shores of what looks like a Norwegian fjord. Princess Elsa has the power to turn everything to ice by a simple touch but cannot control her ability. She has a young sister, Princess Anna, and they are very close. But one night, while they are playing, there is an accident. A wound to the head leaves Anna with a streak of white hair. A wound to the heart however would, we are told, be fatal. As a result of the accident, their parents decide to separate the sisters. 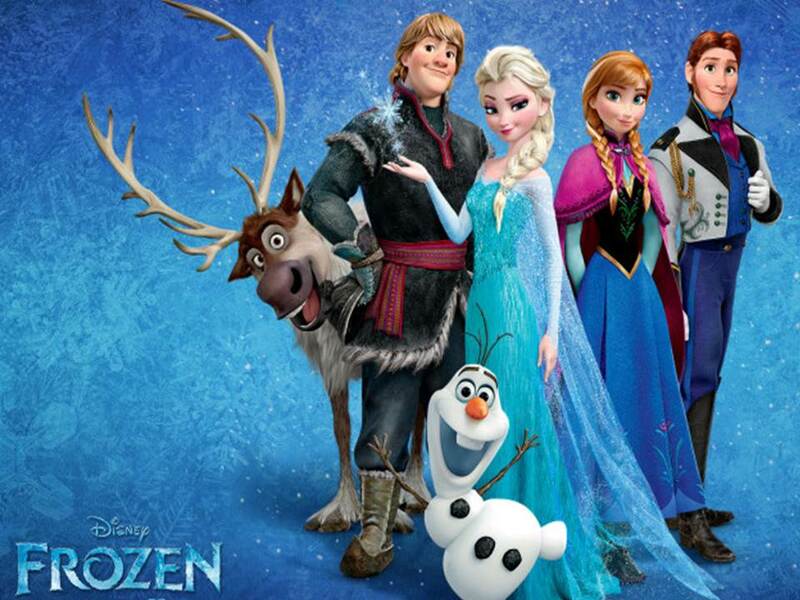 The film Frozen, beautifully and movingly portrays our human predicament. Elsa’s ability to create snow and ice, celebrated and enjoyed when she was younger, accidentally endangers her younger sister. So, in a classic over-reaction, her parents take extreme measures to be sure that her powers stay under control. “Conceal it, don’t feel it,” they insist. Elsa spends her life in her room, hidden from the outside world, gates to the castle closed: and, more significantly, the gates to her sister’s heart remain shut. Frozen: A Story to Melt Your Heart from Stephen Sizer on Vimeo. Rather than learning to control her powers, they control her. Every time she becomes emotional or stressed, her “curse” leads to fear and isolation, locking the kingdom in an everlasting winter. As she walks off into the mountains to be alone (where she can’t hurt anyone), she sings about how she was always being “the good girl she had to be” and never let anyone see the truth. It’s a powerful song. She “couldn’t keep it in” and must “let it go, that perfect girl is gone.” Maybe you can identify. When we feel that we have to perform for acceptance, instead of realising that we are loved for who we are, regardless of performance, it creates a scenario much like Elsa’s. Do you feel you have to perform for other people? That you have to hide who you are, what you think, what you want? Do you deny those things, suppressing them deep down inside. Are you afraid of who you are? Are you ashamed of what you have done? Are you frightened that if people knew what you are really like they would not accept you? Eventually, if we living with denial, eventually it will become visible because we cant keep emotions suppressed and secret for ever. Unfortunately, when that happens, we often find that they surface with the subtlety of a volcano, destroying everything in their path. There is a Marshmallow monster in each one of us. The same is true with desire. 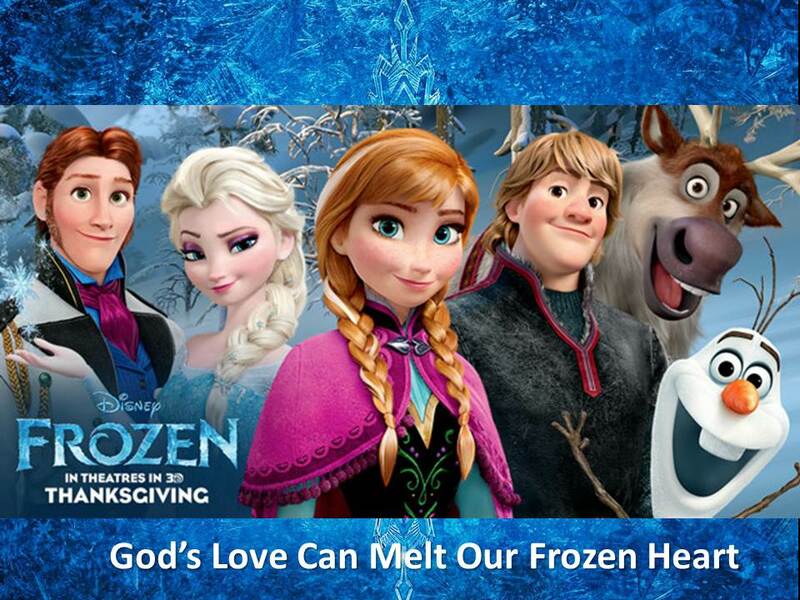 For some reason, the church, like the King and Queen in Frozen, has typically repressed natural desires. Because the things we desire often lead us to do bad things, the church has tried to cut the tree down at the roots, by killing desire itself. That’s the wrong response. We are made with desire, and made to desire. The issue isn’t that we want things, it’s how we handle our needs and desires. When we humbly subject our desires to God, trusting Him (and His word to guide and fulfil desire in the right way and right time, then desire is a good thing. It’s when we give desire free reign to fulfil itself whenever and however it chooses that we get in trouble. Like Elsa, we are humanly powerless to master our nature. Left to ourselves, we will become isolated and eventually alienate everyone around us. And we will make their lives a frozen wasteland too. Love Misused can be so Destructive. “I do! That’s when you put someone else’s needs before your own.” So simple, so un-complicated, and so right-on. True love isn’t the infatuation or connection she felt with her “first love,” Hans. 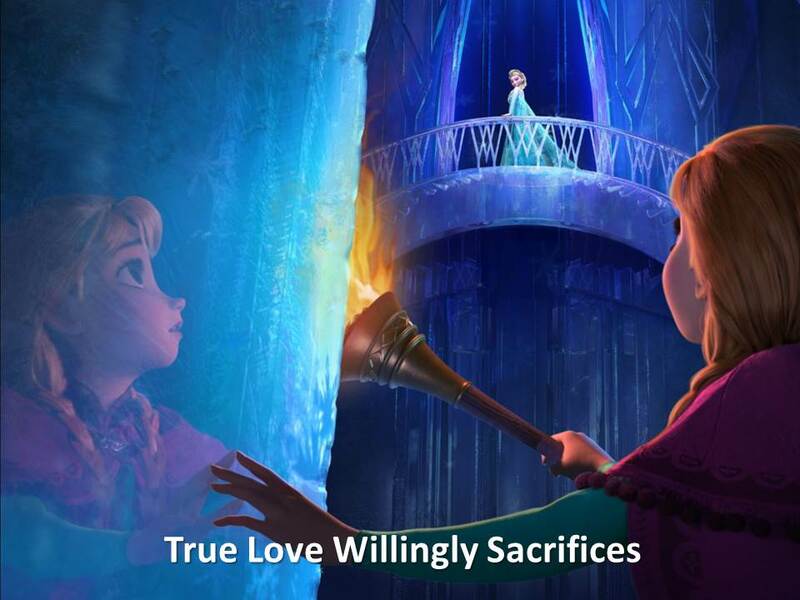 True love is when you sacrifice. It’s when you choose to put someone else’s needs (and desires) above your own. And with that explanation, Frozen becomes no ordinary kid’s movie. Anna stands, nearly frozen to death, as her true love approaches to revive her with a kiss. She believes that this is the only thing that can save her. Then, from the corner of her eye, she sees her sister Elsa, about to be killed by an enemy. Elsa, the woman who has pushed Anna away. The woman whose actions endangered Anna, who refused to help when Anna needed her. So what does Anna do? She turns away from her “true love’s kiss” and runs to save her sister. Anna places herself between the sword and her cursed sister. She willingly dies in order to save the one, who had done nothing to deserve such love. Sound familiar? “Greater love has no one than this: to lay down one’s life for one’s friends.” (John 15:13). 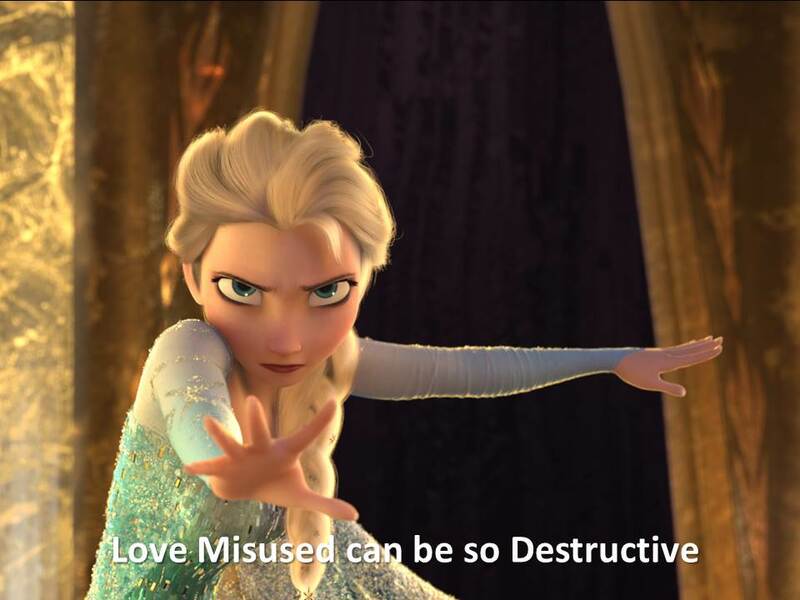 Love Misused can be so Destructive. But True Love Willingly Sacrifices. Anna’s story doesn’t end there, just as Jesus’ didn’t. It was the very act of sacrificial love which melted Anna’s heart and brought her back to life, again fulfilling the Jesus archetype. The Bible says that “perfect love casts out fear.” This is exactly what we have with Anna and Elsa. Anna sacrificed her life for Elsa, and that perfect love cast out Elsa’s fear. When the risen Anna explains that it was love – not a kiss which unfroze her, something clicks in Elsa too. Never before had she heard that. Never had she tried that. She had spent a lifetime trying to “earn” her goodness (“Be the good girl you always have to be,” is a repeated part of her monologue song.) Now, she stopped trying to earn it and revelled in the unearned love that her sister had shown her. Frozen is a beautiful movie about real love, about fear, about hiding and suppressing who we are, but it is also about honesty and courage, about perseverance and self-sacrifice. God’s love brings life out of death. Because true love can melt a frozen heart. And this is why the movie Frozen can point us to the love of God, who sent his willing son Jesus to this earth as a baby, to become a man who died in our place that we might be delivered from the curse of our own nature. There is a redeemer who can melt our frozen hearts, heal our hurts, and help us use our gifts and talents for the benefit of others. This is how we become the people we were destined to be. This is the good news of Christmas. After Christmas if you would like to find out more about how God’s love has been revealed in and through Jesus, then consider joining Christianity Explored. Leaflets at the back. 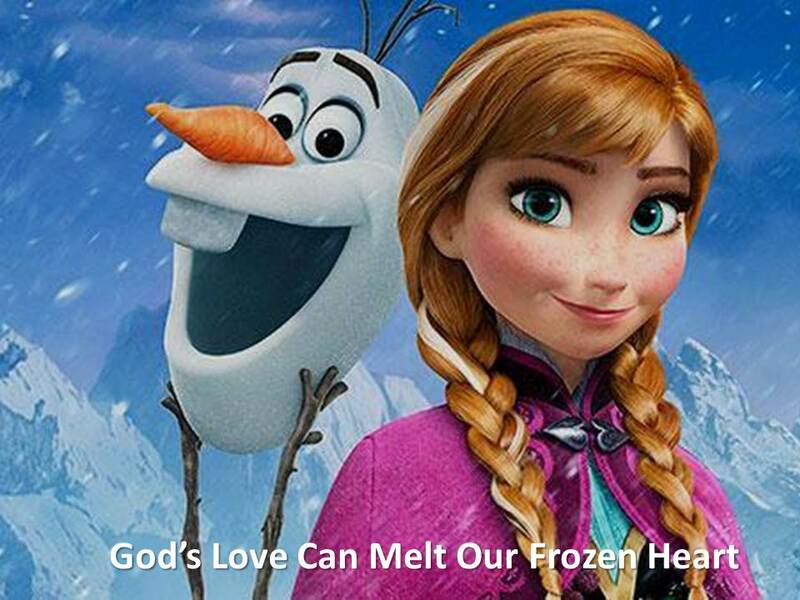 Disney has made a princess story that ends with a different kind of ‘happily ever after’ – the kind that points to real love, authenticity and salvation – And that is why I encourage you to see the film and remember only Jesus can truly melt frozen hearts. With sincere and grateful thanks to Stacy Tuttle and her resources, “Disney’s Frozen: A Warm Story”, on Shepherd Project, and also Michael Belote’s, “Sin and Redemption in Frozen” Reboot Christianity for ideas and content. This entry was posted in Sermons, Theology, Virginia Water on December 22, 2013 by Stephen Sizer.